Golden Joysticks: Win an Xbox 360! 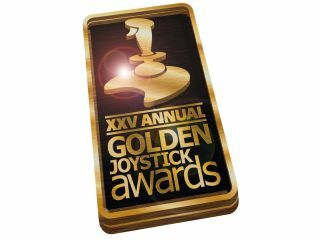 The 25th Golden Joystick awards are coming this way in October - you might have noticed the logo on the site. Organised by Future, it's the world's longest-established video games awards ceremony. With 17 awards up for grabs, the Golden Joystick Awards 2007 celebrates all-round excellence in video gaming. Crucially, they're the only gongs voted for by those who matter most - gamers themselves. Award categories this year include: Ultimate Game of the Year, Innovation of the Year, Handheld Game of the Year, Xbox Game of the Year and many more. Win an Xbox 360 Elite! To celebrate the 25th anniversary of spray-painted joysticks, Future is giving one super-fan the chance to attend this year's awards, get legless at the legendary aftershow party (but only if you're over 18), and also take home an Xbox 360 Elite and all the games featured in the Xbox category! All you have to do is refer the most friends to vote for their favourites in the awards. Vote here and you can start referring your friends right away, with banners and links to add to your blogs, websites or profiles to help you. The final results of this year's Golden Joystick Awards will be announced at the now infamous awards ceremony, held at London's Park Lane Hilton on Friday, 26th October. Once again, the event will be broadcast live on our sister websites CVG, GamesRadar and NextGen.